Right now, we have more 1967 Topps baseball cards high number and rookie cards that we have ever had in stock. The 1967 Topps set is one of the most difficult to complete due to the high number seventh series, which consists of cards #534-609. The high number series was not released in all parts of the country, was short printed, and was released at a time when the football season was just starting. These three factors make it very difficult to find any seventh series cards. The 1967 Topps star cards are mostly head-shots. Cards #150 Mickey Mantle, #200 Willie Mays, and #400 Roberto Clemente are all three tight head-shots. Card #45 Roger Maris is the first to show him as a St. Louis Cardinal. He would play for the Cardinals for another 2 years. Some of the most attractive cards are #250 Hank Aaron and #430 Pete Rose. Both Rose and Aaron are shown in their batting stances. Aaron looks like he may be taking batting practice, while Rose is standing with his back to the outfield of what could be spring training outfield. The 1967 Topps baseball card set has several key rookie cards. 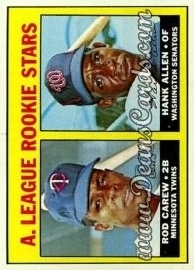 Card #569 Rod Carew and #581 Tom Seaver are part of the high number series, so both can be very difficult to find. 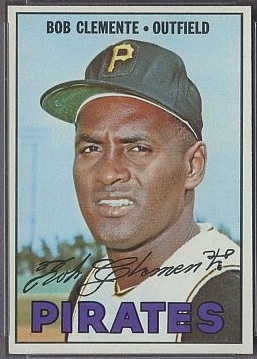 Please click here to view our entire inventory of 1967 Topps baseball cards.